Home > ROTC > Why Choose Army? Cadet Command, through targeted recruiting, rigorous leader development and focused retention, commissions the future Army Officer leadership for service to the Army and Nation. ROTC is the largest producer of Army officers, over five times more than the United States Military Academy at West Point. Our students take full advantage of college life and activities while training to become officers. They engage in unparalleled direct leadership application while participating in the Leader Development Program both on campus and during summer off-site experiences. 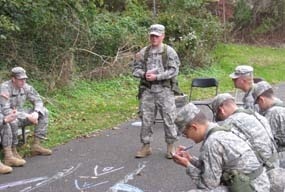 Some Cadets take advantage of the Simultaneous Membership Program (SMP) with local Reserve and National Guard units for additional leadership experience and financial benefits. Upon graduation, all will begin their Army careers as officers, leading the best Soldiers in the world. For the best qualified students, earning an Army ROTC Scholarship will provide 100% tuition and general fees, $1,200/year for books and a monthly tax-free stipend ($300/freshmen, $350/sophomores, $450/juniors, $500/seniors). Cadets in the SMP may also qualify for educational benefits through the Army Reserve or National Guard. For those without a scholarship, officers entering Active Duty upon graduation may apply for the Student Loan Repayment Program for up to $65,000. Historically, our Freedom Battalion’s ROTC program is among the top producers of Army Nurse Corps lieutenants. Our nursing Cadets engage in the same leadership development curriculum as all others, and they also attend a 3- or 4-week Nurse Summer Training Program at one of the Army’s major medical treatment facilities, working one-on-one with an Army nurse and living the life of an Army officer. Nursing Cadets commission into the Army Nurse Corps upon graduation and can serve on Active Duty or in the Army Reserve. Students at these schools may enroll in Military Science classes at their respective institutions and train with the Freedom Battalion. Classes are currently being offered on campus at Widener, Villanova, Penn State-Abington and West Chester.